Brian is responsible for my choice of RV Recreation Activities. It’s all his fault! If he hadn’t mentioned leather carving on this blog I never would have thought of it. I had been into woodworking but due to a fond desire to breathe without whistling like a canary, woodworking stopped being an interest. (Cherry dust isn’t very good for your breathing apparatus.) Also, since my better half and I have been considering full timing in the relatively near future, I was kinda looking for a new, more portable hobby. Then this came along. Leather carving is really old. Our ancestors were doing it about the same time they were drawing on cave walls. First of all let me say that I don’t know why anyone calls it leather ‘carving’. It isn’t like you start out with a leather tree and carve on it until you have a pile of leather chips. When you start out on a project you do use a knife, it’s called a swivel knife since it, well, swivels as you use it but it doesn’t remove anything. It just outlines your design. I would call it leather pounding or mashing or tooling but not carving. But, nobody asked me. Anyway, the first thing you do is ‘case’ the leather. This means get it wet. Leather with just the right amount ‘wet’ in it is just as soft as clay. As a matter of fact, you have to be careful you don’t poke it with your finger nails or you’ll ruin it. After that, you put a drawing or picture on top of the leather and use a pointy object to trace around it to put an impression on the leather. Then you ‘carve’ the outline in it with the aforementioned (neat word) swivel knife and then use a bunch of tools called bevellers and pear tools and stamps and modeling tools and stuff to persuade the leather to look sort of like a picture of what you started with. Then you stain it, then maybe hi-lite it (making the carved and mashed on areas darker) or even paint it (yup, you can paint leather) then seal it then you’re done. Easy, yup, sure. already a couple of things have turned out reasonably acceptable. Then again, with time you will get better and better – hopefully. By the way, this isn’t a bad hobby/art/thingy, whatever you want to call it for, um, people with , er, ‘experience’ or ‘snow on the roof’. It doesn’t take a lot of strength or endurance although fairly good eyesight helps. What can you make with this leather ‘carving’? Well, lots of stuff. I started out with a few belts and a wallet. Then a couple of thingies you put over tissue boxes that make them prettier, or at least ‘different’. My mother-in-law loves hers. But then again she’s in her mid 80s and can’t see too well. Once you really get the hang of it, wedding album covers like Brian’s can be a wonderful gift that is really appreciated. 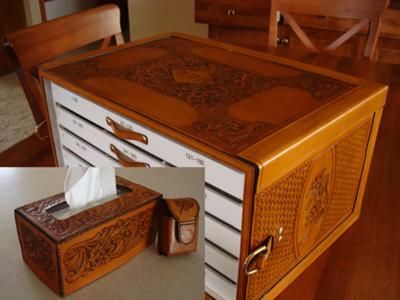 All sorts of art work can be done in leather. If your area has one of those renaissance fair things a lot of people like to dress up in leather. Hey, this is legit. leather clothing not that other stuff. I enjoy the occasional cigar so one of my next projects is to take an old humidor and cover it in ‘finely tooled leather’. If you live out west where there are actual Brian type cowboys, well, enough said – they’re covered in leather. Remember all the knitted scarves and hats your aunt Mildred gave you for Christmas? Well, now it’s payback time. Cost. Yup it costs. How much is sort of up to you. I’m gonna say, honestly, at least a few hundred bucks to start. If you want to do it right you have to have a few good tools. And you’ll need some leather. Do a Google search on ‘leatherworking stores’ and one of the top hits will be for a company that has over 100 stores in the U.S. and other countries. Now, I have absolutely no connection to these people at all but I would suggest you start with them since they are all over the country and can also give you assistance in starting up. If you can find a better source, great but here in the Milwaukee WI area this is all we have and I’ll have to say I’ve been happy with them. Once you get to a level of proficiency like Brian, you could consider selling some of your creations and actually making a few bucks.. Ebay and Craig’s list might be a start. I store all of my stuff in several boxes. One is a 3 drawer plastic tool box I got at Farm & Fleet that holds most of my tools. Another is a large cheap plastic tool box, just a big empty, that holds stains and other ‘chemicals’. And finally a cardboard box that holds small pieces of leather and scraps. Of course then there are one or more rolls of leather. Guess that’s about it. This is a fairly inexpensive and quiet form of recreation that lends itself well to an RVing lifestyle. It’s also a kind of hobby that is sort of different. There aren’t all that many leather pounders around. Check out the internet or find a leathercraft store nearby and see what it’s all about. Enjoy. WoW! John wrote me a while back to see what I thought of his work!... I better get back to work myself our he'll be leavin' me in his leather dust! Considering the relatively short time he's been whittlin' at the craft he's covered a LOT of country! Really awesome, creative work John! I haven't hung a 5 star on any posts yet... I kind of wanted to wait and see what was coming in... leave some room in my opinion... It's gonna be hard to pass this one though! Join in and write your own page! It's easy to do. How? Simply click here to return to Your RV Recreation Activities.